← COPYRIGHT AND WATERMARK YOUR WORK! Years ago I saw this thing in a Swiss newspaper or their online edition rather, where you could hover a loupe over a dressed woman and see her naked in that little circle of the loupe. I found that utterly fascinating. For one because I had and I still have no clue how they did it technically and secondly some women looked so much better naked because they dressed terribly and once you took that away they were a different person. Obviously that sometimes happens the other way round as well. This may have sparked off my idea initially. I like traveling. I like exploring new countries. I like people. I want to see how they live. What they wear. What they look like naked (and who doesn’t)? I love cooking, I love eating. I love my kitchen. I’m always in the kitchen at parties. The kitchen is a very important space in my house and life. It’s where you cook, drink, talk, plan, live. It says a lot about who you are, I think. Are people all the same no matter where they live or come from once they are naked? Does a person come across the same dressed and naked? Does the perception change, maybe? Are kitchens different from country to country? From city to city? From owner to owner? What happens when 2 strangers meet and agree that one of them slowly undresses without the sexual context in which that usually happens? How does my sitter react? Are they shy? Are they posey? Are they just plain normal? Do they try to put on a show? I would have loved to photograph a few sessions in Dubai or China when I was there for a production but it turned out to be impossible. In Dubai it would have meant imprisonment for me and my sitter. The Chinese I was told, don’t open up so easily. There are still lots of places left where I would like to conduct one of these sessions. I’ve always tried to capture the passing of time in my personal work, for which photography seems to be the most inappropriate media at first glance but it is possible. I have used long exposures of up to 8 hours, I have used pinhole cameras with exposure times of a couple of minutes, I have used super 8 cameras that shoot 5 frames per second. 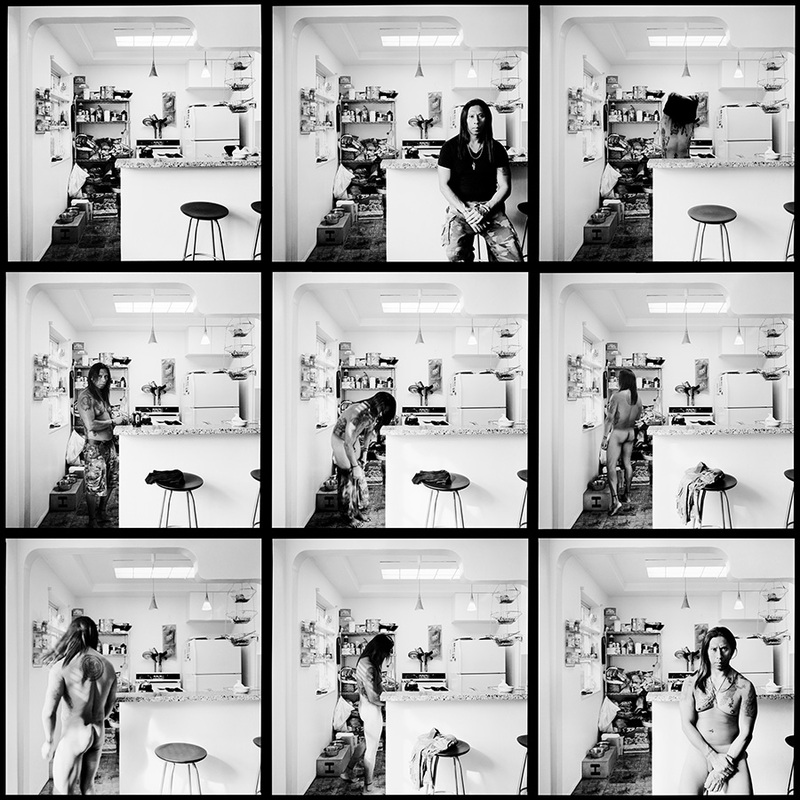 These Naked in the Kitchen photo-montages are condensing a period of 45 minutes down to one image. To me they are like a 9 frame short film that tells its story. So I guess in the end they fit in nicely with my golden thread in my personal work. So in summing up, why Naked in the Kitchen? Because I am just a very curious person and the camera helps me finding things out. To see more of Simon’s work go to his website and Altpick page. This entry was posted in Altpick, Photography and tagged Naked in the Kitchen, simon puschmann. Bookmark the permalink.